As part of The Old Schoolhouse Homeschool Crew, I received a copy of the AIMS Educational Foundation book From Head to Toe. AIMS is a non-profit foundation dedicated to helping teachers give students a solid conceptual understanding of math and science. Last year, I reviewed the AIMS Earth Book. We are still using that book. In fact, I just posted a picture of the kids doing an experiment in my Our Homeschool Week in Review post. This revised edition of From Head to Toe, which includes 25 new activities, will guide students in explorations of the systems and senses of the human body. Students will look at how the nervous, circulatory, respiratory, digestive, urinary, and musculoskeletal systems work together to keep us alive. They will also explore how our sensory organs provide us information about our world. Students will be engaged as they create models for each system and see firsthand how things really work. In the activity “Breathe In, Breathe Out,” students will use a two-liter bottle, balloons and straws to build their own set of “lungs” and to see what happens as air is inhaled and exhaled. In the activity “The Food Tube,” students will work as a team, creating a life-size tracing of a classmate and calculating the length and location of the digestive tract; they will be amazed as they discover the crepe paper used to represent the small and large intestines measures up to five times the height of the body. Teachers will enjoy the flexibility that From Head to Toe offers, as they can adjust the depth of each unit to fit the needs of their class. They will also find the rubber band books—small books the students assemble and hold together with a rubber band along the spine—ideal in providing necessary content and relevant information. Whether building a model heart or acting out the actions of neurons as they transmit messages to and from the brain, From Head to Toe provides a broad, complete look of the human body that will engage students as they learn about their magnificent bodies. 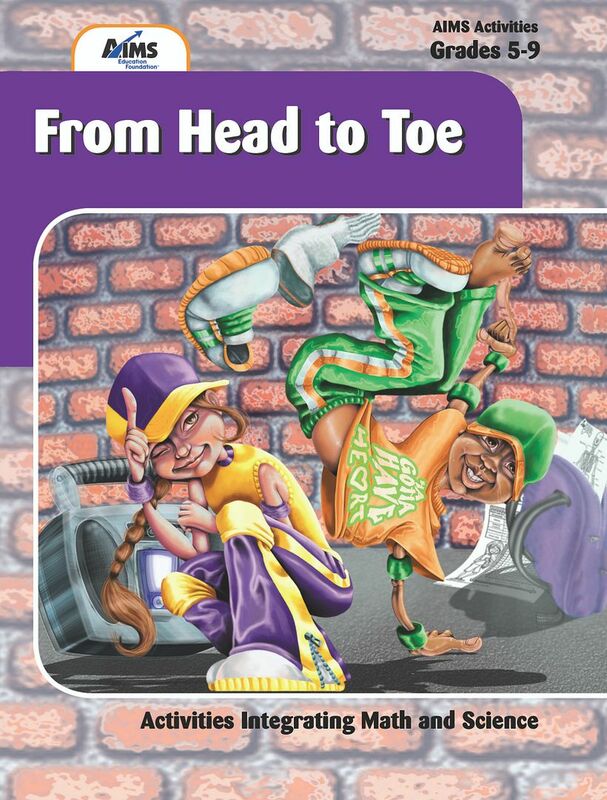 From Head to Toe is written for grades 5-9, with 27 activities in it’s 288 pages. What I love the most about AIMS books are the convenience of the CDs. The CD, included with the book, has all the printable pages on it. It’s so easy to slip the Cd into your computer and print the pages you want. Much easier than trying to copy reproducible pages from the book! The kids love the rubber band books and fun activities. I love the thorough information in AIMS books. Rubber band books are included in the printable pages. After printing, the students fold the books and put the sections in order. The books are then held together with rubber bands. Not only are the books fun to make, they are full of great information that the kids can refer to over and over. See what other The Old Schoolhouse Homeschool Crew Members are saying about AIMS Education Foundation books like From Head to Toe.